The man is due in court this morning. GARDAÍ IN WEST Dublin have seized drugs, cash and other property during a search operation near Clonee. Officers from Blanchardstown and Finglas carried out a planned search of a house in Dublin 15 on Friday. 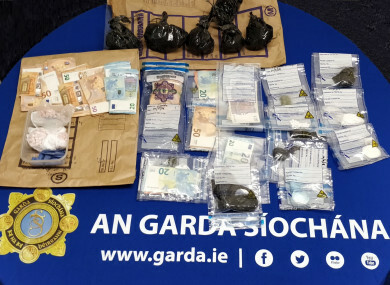 During the course of the search, controlled drugs comprising of cocaine, cannabis herb and MDMA tablets with an estimated street value of up to €8,000 was seized. In a follow up search of two cars, cannabis herb and MDMA tablets with a combined estimated street value of up to €8,000 was seized. In addition, cash in excess of €7,000 was seized along with a number of debit cards and passports. Email “Cocaine, debit cards and passports seized in west Dublin organised crime operation”. Feedback on “Cocaine, debit cards and passports seized in west Dublin organised crime operation”.